Curtiss Hawk 75A-4s ordered by France went into service with the RAF as Mohawk IVs after being modified extensively for British operation, more than 200 eventually being taken on charge from various sources, together with a few Mohawk Is, IIs and IIIs which were the RAF designations for the earlier French versions. A Mohawk II is shown. Curtiss Hawk 75A-4s ordered by France went into service with the RAF as Mohawk IVs after being modified extensively for British operation, more than 200 eventually being taken on charge from various sources, together with a few Mohawk Is, IIs and IIIs which were the RAF designations for the earlier French versions. A Mohawk IV is shown. Twelve of the RAF's Mohawk IVs were transferred to Portugal in 1941, and were eventually sent to the Azores for local defence duties. 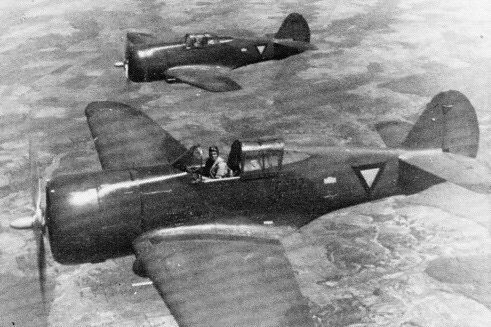 Hawk 75A-7s of 1.Vliegtuigafdeling on patrol over Java, near the town of Cheribon. A pre-delivery picture of a Hawk 75A-9 in the markings of the Imperial Iranian Air Force. The ten aircraft of this type were never operated in Iran, but passed into service with the RAF in India as Mohawk IVs. One of the ex-French Air Force Curtiss Hawk 75A-3s transferred to the Finnish Air Force after being captured by the Wehrmacht.